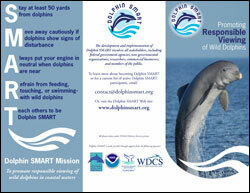 Click here to view a checklist of Dolphin SMART program requirements. Attending a training workshop is the first step to becoming recognized as Dolphin SMART, so be sure not miss this opportunity! The training workshop will offer a comprehensive review of the Dolphin SMART program and its benefits to wild dolphin populations and to businesses that chose to participate. There will also be presentations by researchers about local dolphin populations and natural dolphin behaviors. All area dolphin viewing businesses, as well as businesses and organizations interested in becoming Proud Supporters of Dolphin SMART, are encouraged to attend to learn more about the program benefits and how to participate. If you are interested in becoming Dolphin SMART but cannot attend one of these workshops, please let us know so we can work to accommodate your business for future workshops. The workshops are open to the public and anyone interested in wild dolphin conservation. WHO: We are tentatively planning a Dolphin SMART training for early 2015. Interested businesses should contact: grant.craig@noaa.gov.